Welcome to edition 441 of Insider Weekends. 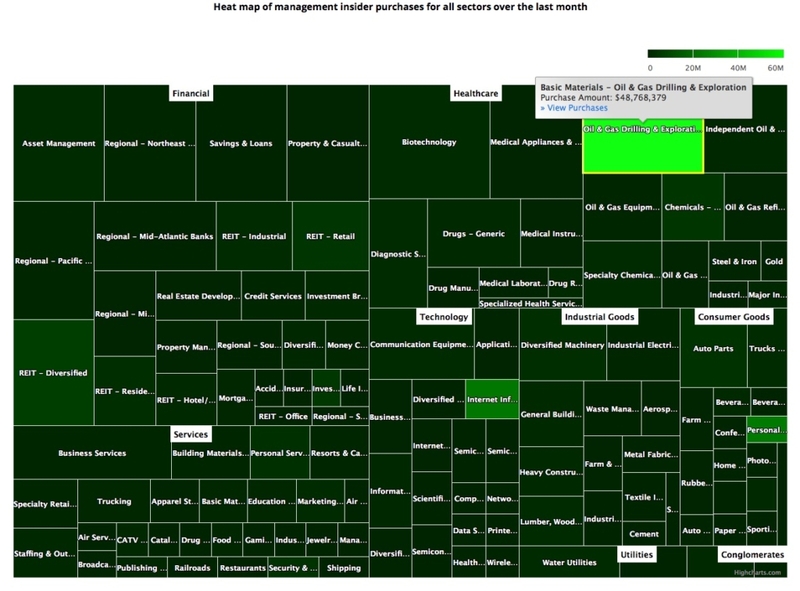 Insider buying decreased last week with insiders purchasing $90.28 million million of stock compared to $130.03 million in the week prior. Selling on the other hand increased with insiders selling $1.46 billion of stock last week compared to $1.14 billion in the week prior. Sell/Buy Ratio: The insider Sell/Buy ratio is calculated by dividing the total insider sales in a given week by total insider purchases that week. The adjusted ratio for last week went up to 16.17. In other words, insiders sold more than 16 times as much stock as they purchased. The Sell/Buy ratio this week compares unfavorably with the prior week, when the ratio stood at 8.78. Director Jay C. Hoag acquired 1,049,403 shares of this real estate information provider paying $35.45 per share for a total amount of $37.19 million. These shares were purchased indirectly by TCV Mariner Investor IX, L.P.
Zillow also made it to the top of our list last week and we wrote the following about the company then. Zillow has had a wild ride in 2018 with the stock trading all the way up to $65.70 by mid-June before losing more than half its value through last week. The selling accelerated last week after the company reported a 21.7% increase in third quarter revenue to $343.09 million, which missed estimates by a sliver and more importantly guided Q4 revenue below expectations. Investors were also unhappy that Zillow has gotten into the business of buying and selling homes, which unlike Redfin’s business model, requires Zillow to hold homes in inventory. Some investors referred to this new line of business as a “flipping business” and it comes at a times when the housing market is cooling. Does this sharp decline in Zillow present a buying opportunity? Jay Hoag and the co-founder of Zillow Rich Barton certainly seem to think so. When Jay Hoag purchases shares of a company, I pay attention, as the timing of his purchases have been spot on in the past. Last Monday the stock shot up nearly 12% and continued going up through most of the week before settling a little lower on Friday. Mr. Hoag not only purchased more shares last week, he did so at higher prices than the week before. Unlike the prior week where he only purchased non-voting Class C shares (Z), this time around he bought both Class A shares and the more liquid Class C shares. Class A shares have voting rights and trade under the symbol ZG. You can view the list of recent insider transactions for Zillow Group, Inc. here. Director Tamara Hughes Gustavson acquired 379,400 shares, paying $19.78 per share for a total amount of $7.51 million. Ms. Gustavson increased her stake by 2.16% to 17,983,378 shares with this purchase. Director B. Wayne Hughes acquired 379,400 shares, paying $19.78 per share for a total amount of $7.51 million. These shares were purchased indirectly through a trust. It feels like déjà vu because we also saw this father-daughter team purchase shares last week. We wrote a more detailed post about American Homes 4 Rent for premium members in September. Director Shon A. Boney acquired 88,500 shares, paying $22.83 per share for a total amount of $2.02 million. Mr. Boney increased his stake by 1569.71% to 94,138 shares with this purchase. Interim Co-CEO and CFO Bradley Lukow acquired 10,000 shares, paying $23.09 per share for a total amount of $230,864. Mr. Lukow increased his stake by 7.72% to 139,598 shares with this purchase. Chief Merchandising Officer David McGlinchey acquired 5,000 shares, paying $23.10 per share for a total amount of $115,500. Mr. McGlinchey increased his stake by 71.08% to 12,034 shares with this purchase. There was speculation last year that Albertsons was in talks with Sprouts Farmers Markets to acquire the company. With the Rite Aid/Albertsons merger falling through this year, it is entirely possible that Albertsons or others may consider an acquisition of Sprouts Farmers Market. The company continues to execute well and top line growth was in double digits territory for six quarters in a row before dipping to 9.9% in Q3 2018. You can view the list of recent insider transactions for Sprouts Farmers Market, Inc. here. Director Martin E. Franklin acquired 126,000 shares, paying $10.98 per share for a total amount of $1.38 million. These shares were purchased indirectly through a trust. Director Ian G. Ashken acquired 28,000 shares, paying $10.98 per share for a total amount of $307,440. These shares were purchased indirectly by IGHA Holdings, LLLP. You can view the list of recent insider transactions for Platform Specialty Products Corporation here. Director Michael Andrew Kumin acquired 18,500 shares of this home furnishing company, paying $89.25 per share for a total amount of $1.65 million. Mr. Kumin increased his stake by 11.63% to 177,605 shares with this purchase. Mr. Kumin has served on Wayfair’s board for over 7 years and is a Managing Partner of the private equity firm Great Hill Partners. You can view the list of recent insider transactions for Wayfair Inc. here. Director Robson S. Walton sold 2,731,356 shares for $95.26, generating $260,178,174 from the sale. These shares were sold indirectly by a trust. Executive Vice President John R. Furner sold 4,000 shares for $97.34, generating $389,360 from the sale. Director Evan Clark Williams sold 3,759,165 shares of Twitter for $31.61, generating $118.84 million from the sale. These shares were sold indirectly by the Someland Foundation. Chairman of Executive Committee Scott D. Cook sold 152,001 shares for $197.41, generating $30 million from the sale. EVP, GM SBSEG Sasan K. Goodarzi sold 85,835 shares for $196.74, generating $16.89 million from the sale. Chairman, CEO & President Brad D. Smith sold 22,418 shares for $205.63, generating $4.61 million from the sale. EVP, Chief Technology Officer Henry Tayloe Stansbury sold 7,302 shares for $197.82, generating $1.44 million from the sale. EVP, Consumer Group Gregory N. Johnson sold 5,029 shares for $200.91, generating $1.01 million from the sale. You can view the list of recent insider transactions for Intuit Inc. here. Director Mark L. First sold 540,000 shares for $72.46, generating $39.13 million from the sale. Chief Financial Officer Brian Poff sold 5,000 shares for $73.76, generating $368,800 from the sale. You can view the list of recent insider transactions for Addus HomeCare Corporation here. Director Alan G. Hassenfeld sold 394,650 shares of this toy company for $97.30, generating $38.4 million from the sale. You can view the list of recent insider transactions for Hasbro, Inc. here. Disclaimer: I hold positions in AMH and TWTR. Please do your own due diligence before buying or selling any securities mentioned in this article. We do not warrant the completeness or accuracy of the content or data provided in this article.